The past few days have been super busy. 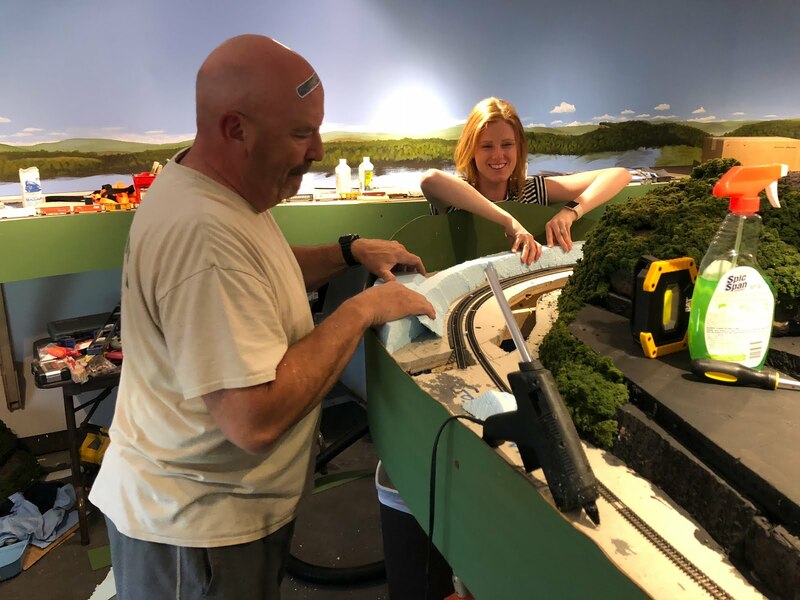 It started with a visit to Paul Dolkos's layout. He wanted to confer on some ideas for his back drop. While I was there I got to admire the completed pier shed that I helped build. Paul added the cargo masts to the roof and completed the rest of the details. I had previously cut many of the structure parts on my laser for him. 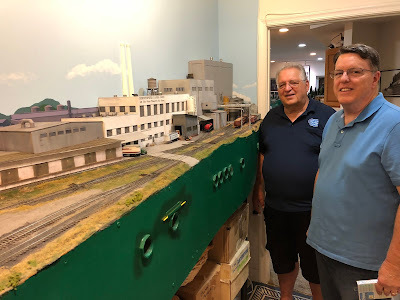 It's always a treat to visit Paul's layout. Tak and Jennifer in my general costume. Later that day my brother Rob, his wife, Terry, and their daughter, Jennifer, arrived. 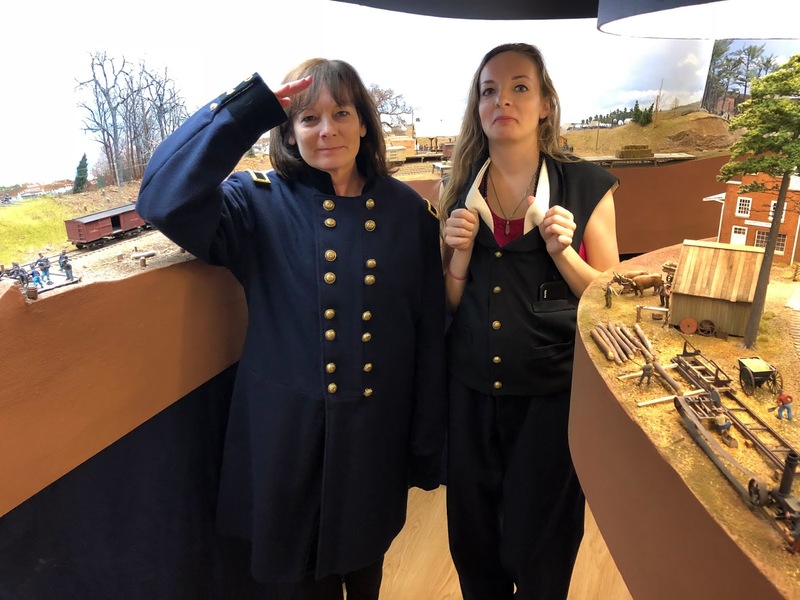 They had a lot of fun running trains on the layout and doing some cos-play in my general's costume. On Friday, Dr. Tak, one of Rob's friends from his days working with the Japanese Space Agency, also visited. 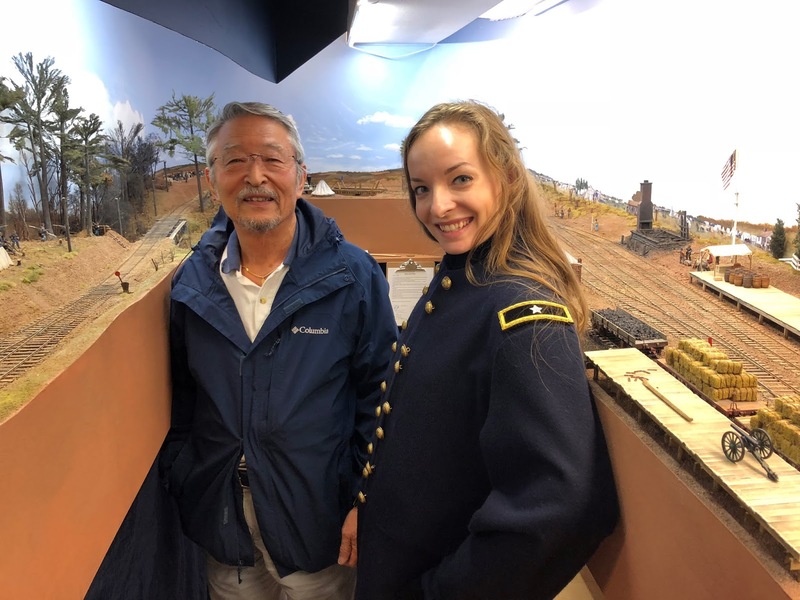 Tak really enjoyed the trains, though he is not a model railroader himself. 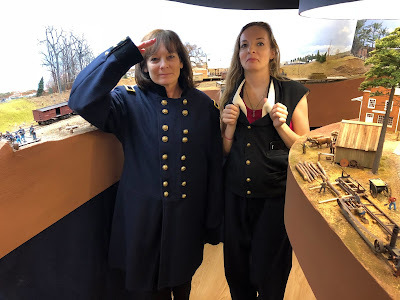 Jennifer and I also did a Facebook live video of her operating the Aquia Line. That was an interesting experience. We had about 100 people watching live by the end. On Saturday the visits continued. 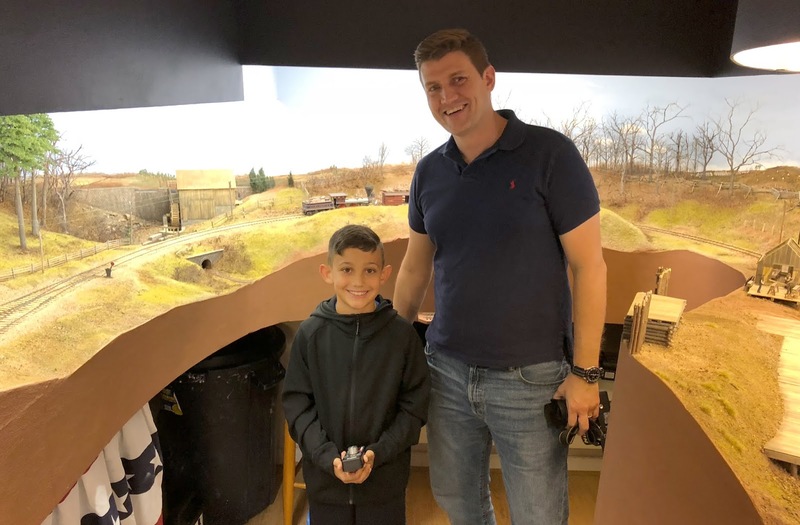 Brad Trencamp brought his nephew Paxton, to see and operate the layout. Paxton got to run trains on the Aquia Line and PoLA. Brad giving Paxton hand signals on PoLA. Later, Bill and Andy Sparkmon and their friend Bob Jackson, from Baltimore, arrived to visit the layouts. Bill is an old friend from my C&O Modeling days. He used to live near Pratt, WV on the C&O mainline near Handley. 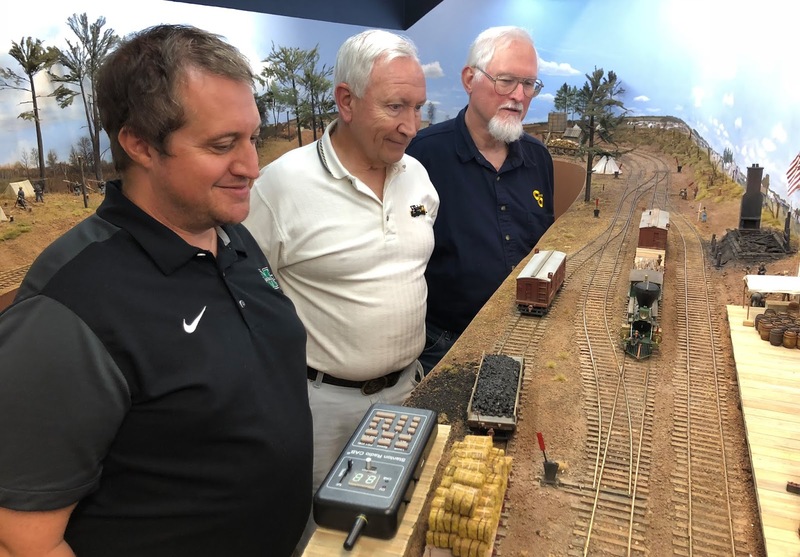 Bill was an excellent source of prototype information on the C&O. It was great to reconnect with them. Finally, John Drye arrived to help me work on the modules. I had previously decided to shorten the length of the modules by a foot each. We joked, in true double speak way, that they were always going to be 4-feet. We have the plans to prove it. So John helped me do the job. It was a easy to do using my track saw and associated track. The new modules are two feet shorter overall, but will fit much better in the space available. The track plan will be simplified a bit, but still captures the essence of the scene. I took a trip west today to visit with Pete LaGuardia, Mat Thompson and John Swanson, the ringleaders of the "Gainesville Mafia." 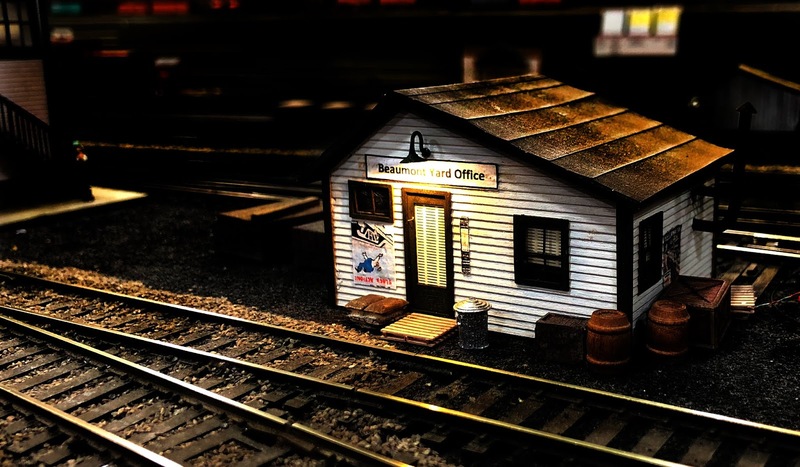 Gainesville is a distant suburb of Washington, DC which has attracted a surprisedly large number of model railroaders in our region. The combination of more affordable new housing with large basements seem to be the key factors. All three of them have large operating layouts. First stop was at Pete's house to see his layout and pick up some new products for Alkem Scale Models. These are gooseneck lights that will be available for sale on www.alkemscalemodels.com as soon as I can get some installed and an instruction sheet made up. (see photo above). 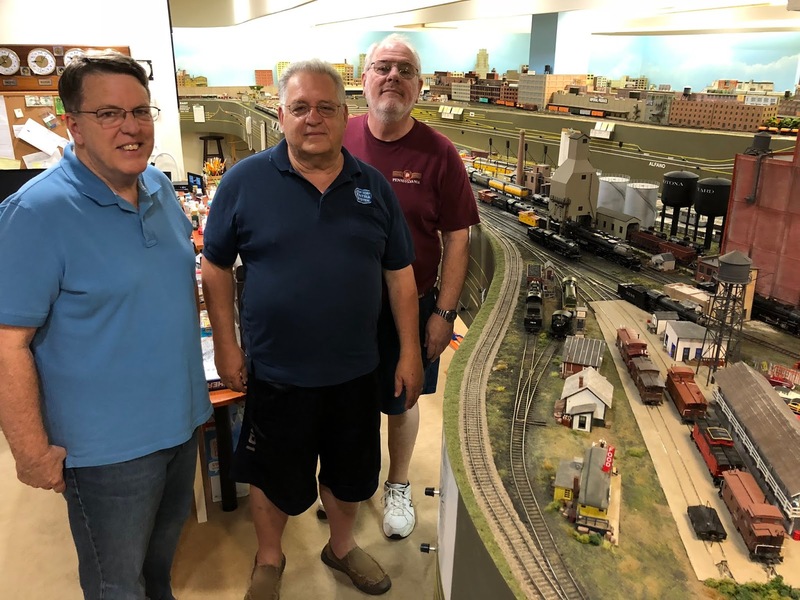 Pete's layout is freelanced based loosely on a location in Missouri as he features NYC, UP, and ATSF passenger trains. I got to run a NYC 20th Century Limited passenger while there. 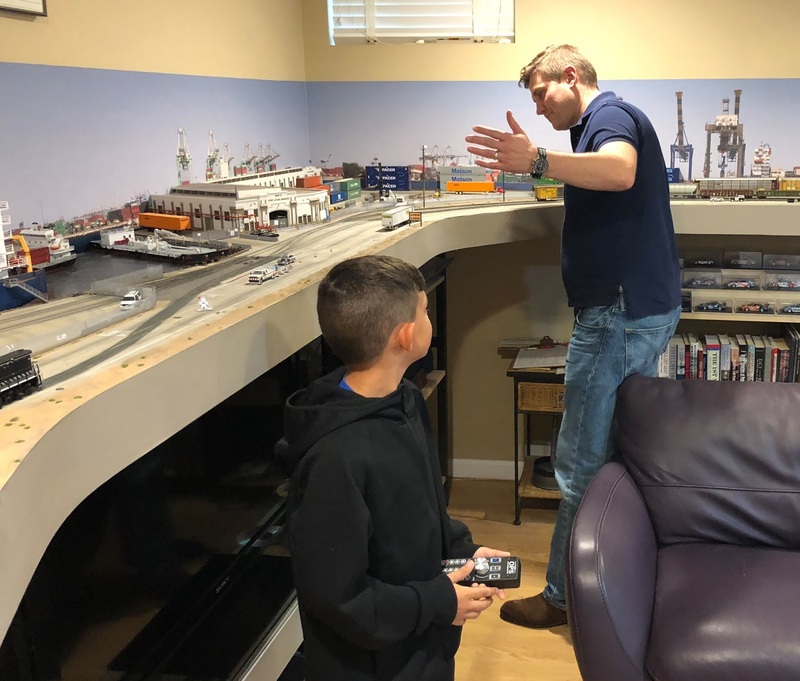 Then we stopped by Mat's Oregon Coast layout to see the new areas he has developed in the back room. I hadn't been to his layout in several years. Mat's layout is nearly finished, highly detailed and has several waterfront scenes (much to my delight). John's Pennsy layout is relatively new. He said he had been working on it for 18 months. His focus is electronics and operations. 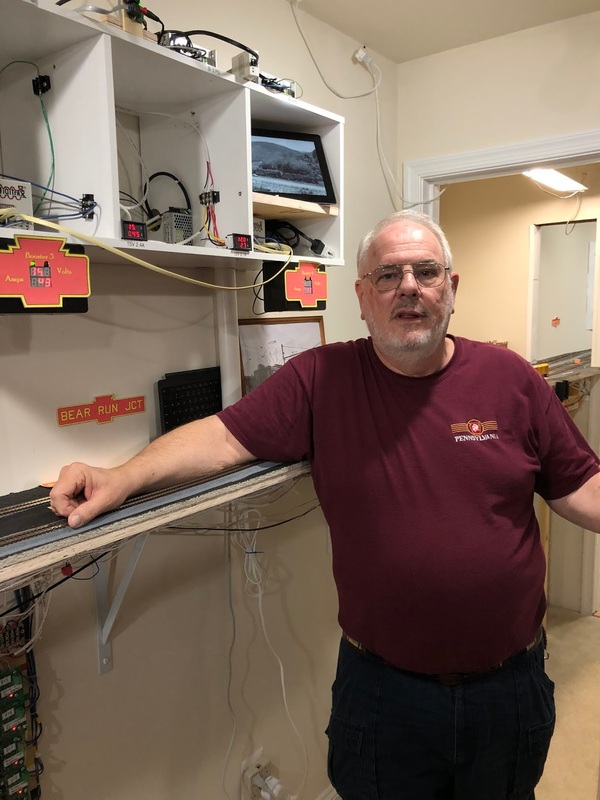 He has all kinds of cool gadgets running on his layout including tablets to DCC and locomotive control, and operating uncoupling magnets. After lunch, I drove to Blue Ridge Summit to pick up supplies for my latest module project. Both Bonnie and Brian were there and it was fun to catch up with them on news, as well as to shop in their well stocked store. It's probably one of the best in the US. Unfortunately, I got stuck in a massive traffic jam on my way home due to a fatal accident on the Wilson Bridge. Although I did not have to cross that bridge, the spill over traffic caused congestion all over the Capital region. Fortunately, I made it home safe, although delayed by an hour and half. I am back in Virginia after several weeks of travel to various spots around the U.S. The first was a week long road trip to Pikeville, Kentucky for my father-in-law's final commitment ceremony. Along the way we visited my son in Lexington, KY. The focus of the trip was golf and family events, so not too much time for rail fanning. Nonetheless, I managed to sneak in a couple photos of rail scenes we spotted on the way. After a few days home to catch up on chores, I headed to Denver for 10 days to visit my daughter and son-in-law. Danica and I then went on a 7 day road trip to visit several western states, especially the last 3 continental states I had not been in. They were Nebraska, North Dakota and Montana. 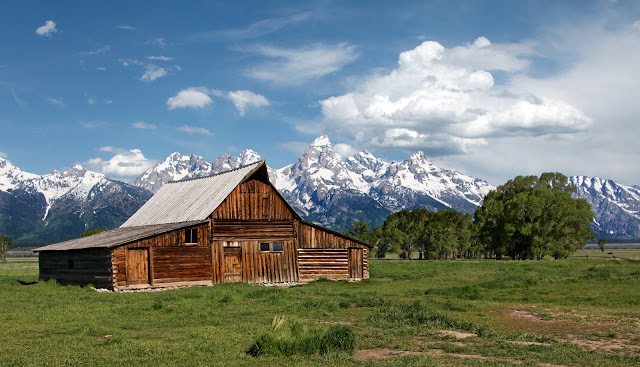 Along the way we stopped at various obscure and interesting places, especially Mount Rushmore, Beartooth Pass, Fantasy Canyon, and Yellowstone and Grand Teton National Parks. See the video at the bottom of the post for a summary of the trip. Pusher on a east bound coal train into Alliance, NE. We saw some rail action on the trip, but again our focus was not on rail fanning. Yellowstone was spectacular, as was the Grand Tetons. After Grand Teton NP, we drove to Utah and stayed for two nights with Brian and Michelle Brendel. 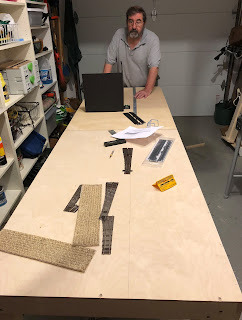 One full day was a work day on Brian's N Scale CSX Mountain Sub layout. Brian had a full do list for me to work on. I got almost all the tasks done, plus a few others not on the list in 14 hours of work. That evening, the Friday Night Group showed up and had an amazingly productive work session. A few more sessions like that and Brian will be able to run trains, now all he had to do is lay some track. Danica helping Brian install hills at Panther Gap. Somehow I got blamed for Brian's head wound.